Sitting in the tiny jail cell that has been her home for months, Judge Maria Lourdes Afiuni said she knew a ruling she handed down in December might incense Venezuelan President Hugo Chávez. But she was astonished when intelligence agents arrested her and the entire courtroom staff 15 minutes after she freed a prisoner the government wanted in jail. “I never thought — never — that the violations would get to this point,” said Afiuni, 46, who is being held here in a cellblock filled with women charged with drug trafficking and murder, some of whom she sentenced. The jailing of a tenured judge who angered the president has brought into sharp focus the increasingly tight control Chávez exerts over the judiciary, a situation condemned by legal watchdog groups and constitutional experts across the Americas. Advocates for an independent judiciary in Venezuela also say the judge’s plight, along with the arrests of dozens of government opponents in recent months, demonstrates how far the Chávez administration will go to quell dissent. Afiuni was charged with corruption and abuse of authority after she conditionally freed Eligio Cedeño, a banker who had run afoul of the government and was accused of evading currency controls. Cedeño waited in jail nearly three years for his first court hearing, which exceeded legal limits, Afiuni said in a recent interview. He fled the country and is seeking political asylum in Miami. “I call for 30 years in prison in the name of the dignity of the country,” he said. 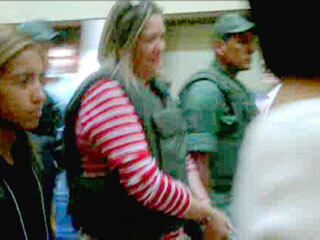 More than any other case, Afiuni’s arrest has alarmed independent justices and those who track Venezuela’s judiciary. Bar associations from New York to Madrid have demanded her release, and thousands follow her through Twitter feeds. Her first court hearing has been postponed repeatedly by “suspicious delays,” said one of her attorneys, Juan Ernesto Garanton. Chávez and ministers in his government frequently declared the judicial system in place before his election in 1998 a vestige of a corrupt system that needed to be jettisoned. In its place, the government in 2004 created a Supreme Court overwhelmingly sympathetic to the president, according to a recent report by the human rights arm of the Organization of American States, of which Venezuela is a member. The Inter-American Commission on Human Rights also found that Venezuelan judges have been dismissed after issuing rulings that antagonize the government, and that hundreds more are named to posts through an opaque system. Legal experts in Venezuela estimate that about half of the judges are provisional, which they say leaves them more susceptible to pressure. Many of the remaining judges have demonstrated their allegiance to Chávez and expressed support for the government’s efforts to create a system that blurs the separation of powers. Escarra, the pro-government lawmaker, said judges who were replaced had issued rulings that favored people who wanted to destabilize Chávez. He said accusations that the president interferes in the judiciary were exaggerated. Some judges have wound up like Juan Carlos Apitz. In 2003, Apitz was on a five-judge court that ruled that doctors from Cuba, Venezuela’s closest ally, could not work in Venezuela unless they revalidated their qualifications. At the time, Cuba was deploying thousands of doctors to Venezuela in exchange for cut-rate oil. Chávez called the decision “unconstitutional.” Then 46 intelligence agents raided the court and searched through paperwork for more than 10 hours. Apitz and two other judges who had ruled with him were banished from the judiciary; the two dissenters were promoted to the Supreme Court. Apitz said the dismissal of independent judges means that opponents have no real legal recourse if they want to challenge a government investigation or an arrest. That is particularly troubling these days, he said, because the intelligence service has arrested dozens of anti-government student protesters and opposition leaders in recent months. Haha I’m really the only reply to this great read? !